New Listing Highlights as of 13 December! 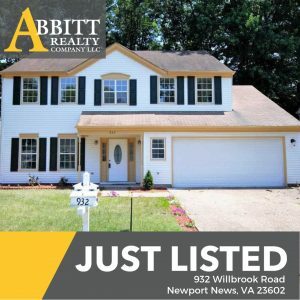 | Hampton Roads Real Estate :: Abbitt Realty Co.
New Listing Highlights as of 13 December! 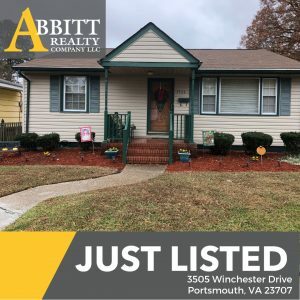 New Abbitt listings to check out in Gloucester, Newport News and Portsmouth! 2808sf potential in main residence (currently 1404sf finished 3 bedroom, 2 bath loft style home atop an oversized 4 bay garage w/ full bath). Gorgeous wood floors throughout living spaces. Ceramic tile floors in kitchen & bathrooms. Woodstoves on both levels. AND …an additional 816sf unique GUEST COTTAGE perched over beach &river. FUN property! Guest Cottage has original essences & feel of its circa 1900’s origin w/masonry fireplace, original wood floors, bead board panel, 2 bedrooms, bath, living room & kitchen! York River views are paramount w/deliberately placed shrubs & trees allowing for maximum privacy on nearly 1.3 acres. Listed below tax assessment of $848,220 & main residence is high above the flood zone. Garage for office, workshop, or RIVER TOY storage!!! Or convert for add’l living space. 9′ ceilings, open floor plan w/ emphasis on the river views & amazing sunsets. 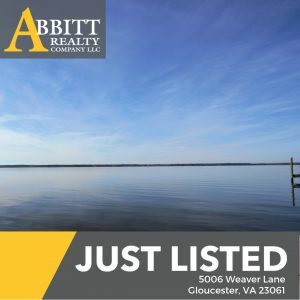 Private dock with 5 year old boat lift, brick smoker, greenhouse, herb garden/blueberries & more! Click for Additional Details! This house is located in the Dunhill neighborhood of Kiln Creek with a nice sized backyard with deck and seller has redone almost the entire house! New flooring throughout, freshly painted, new kitchen cabinets, stainless steel appliances and granite countertops. Kitchen is open to eat-in area and family room with a fireplace. House also has formal living room and dining room. All baths have been updated with new lights, vanities, sinks, and faucets. Master suite has a large master bath and walk-in closet. MBA has decorative tile floor, his and her sinks, garden tub, separate shower area, and private toilet area. Most exterior wood has been aluminum wrapped. Click for Additional Details! Take a look at this quaint home with a den off of the kitchen. Great curb appeal, well maintained lawn.Fenced back yard with above ground pool. This home would work for first time home buyers or someone looking to down size. Click for Additional Details! This home is deceivingly large w/over 2600 sq ft on over 4 acres (with additional 3.5 acres of land also available). 40’x28′ Great Room and 23’x18′ Kitchen creates the prefect space for entertaining a large family. This home has been built and owned by one family since 1994. Special features inlcude cathedral ceilings, recessed lighting, fenced rear and front yards, gas heat, masonry fireplace w/woodstove and formal living room. Multiple exterior structures include 3-bay detached garage previously used to run “Nathan’s Automotive” for general automotive service. Property is “grandfathered” to allow this business to continue it desired by Buyer. This detached 3 bay garage offers 2816 sq ft, heat & AC, 2-2 post car lifts, 1/2 bath, office, storage, workbenches, 200amp electric service & more! Listing price is nearly $60,000 less than assessed value! Click for Details! NEW LOT LISTINGS – Imagine the Possibilities! 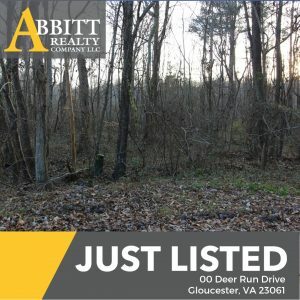 Lots 18 and 19 of Deer Run Subdivision combined for one building lot having 100′ of cul-de-sac, state, paved, road frontage in established neighborhood. County GIS overview attached will give Buyer a visual view of land layout and density of woods. Property cul-de-sac frontage of 100′ widens out to rear property boundary equaling 551′ per the subdivision plat attached to this listing. 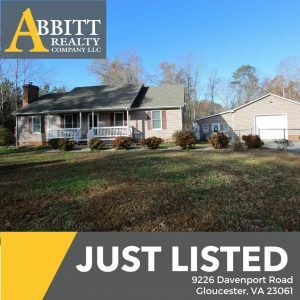 This is a wonderful neighborhood truly convenient to all Gloucester Court house conveniences and approx. 3 miles from Walmart Super Center, Ultra, Starbucks etc. Have a arms length distance from Court House parades, festivals, and fun! Click for Additional Details! Additional lot also available! Lot 22 is wooded building lot in Holly Springs subdivision. 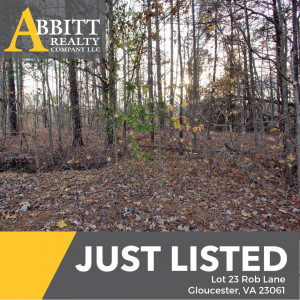 Lot is located in the cul-de-sac to the right of lot 23 and to the left of house numbered 7640 Rob Lane. Both lots offered for sale at $26,900. Don’t miss this opportunity to live within the Gloucester County Court House area limits and only 3 miles approx. from the Super Center shopping including Walmart, Starbucks, Home Depot, etc. Great, established neighbor. Desired Cul-de-sac street is state maintained and paved. Easy commute and within minutes all Gloucester Court House amenities and activities. Click for Additional Details! 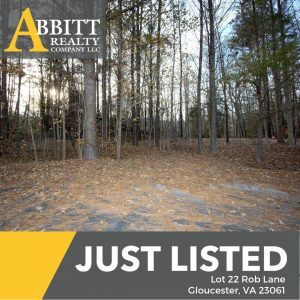 Beautiful, wooded building lot in Holly Springs subdivision. Lot is located in the cul-de-sac to the right of house number 7623 Rob Lane and to the left of lot 22 also offer for sale at $26,900. Don’t miss this opportunity to live within the Gloucester County Court House area limits and only 3 miles approx. from the Super Center shopping including Walmart, Starbucks, Home Depot, etc. Great, established neighbor. Desired Cul-de-sac street is state maintained and paved. Easy commute and within minutes from Parade parameters and all Festival Fun for Gloucester Court House activities. Click for Additional Details! Three adjacent Building lots available within the cul-de-sac of Kelly Avenue each at $24,900. Additional lots also available within the Subdivision on Rob LAne. Wooded, close to all Gloucester Court House conveniences and located on a state maintained, paved street in area of established homes.Lot is to the left of house numbered 7686 Kelly avenue and to the right of two adjacent lots also for sale lot having approx 3/4 acre each.Lots are priced well below County Tax Assessments and recent appraisal values. Click for Additional Details! Lot 28 Kelly Avenue is one of three lots being offered on the cul-de-sac, state paved and maintained street within Holly Springs Subdivision. Priced significantly below County Assessment and recent appraisal. Spacious building lot with 0.68 acres. Lot sits between two additional lots offered for sale for $24,900 each range from 1/2 to nearly 3/4 acre each. Additional lots also available within the Subdivision on Rob Lane. 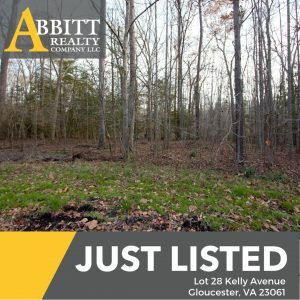 Wooded, close to all Gloucester Court House conveniences. 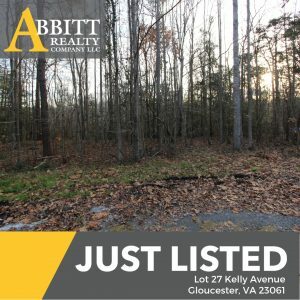 Priced nearly $20,000 below County assessment for Lot 29 Kelly Avenue- Three adjacent Building lots available within the cul-de-sac of Kelly Avenue each at $24,900. Additional lots also available within the Subdivision on Rob Lane. 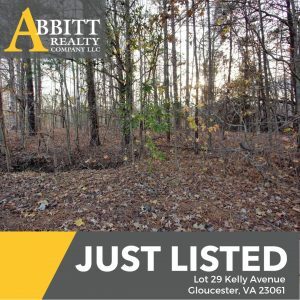 Wooded, close to all Gloucester Court House conveniences and located on a state maintained, paved street in area of established homes.Lot is one lot to the right of house numbered 7711 Kelly Avenue and to the left of two additional lots offered for sales also for $24,900 each having approx 3/4 acre each.Lots are priced well below County Tax Assessments and recent appraisal values.